The Ilanot Review recently published my poem "Saint Christopher in the Copenhagen Metro" which you can read here. Structo Magazine is taking on my Lenten Psalm Contest this year. Entries for the contest open on Ash Wednesday. General submissions open on March 1. In other Structo news, we've just published a new issue with translations from Irish, Scottish Gaelic, Classical Chinese, and Jèrriais. Our chief editor recently did an interview with Margaret Atwood which will appear in the next issue. I've an imitation of Alcaeus coming out in the next issue of Midwestern Gothic. Balustrade comes from the Greek word from pomegranate flower. My hairstylist on being able to tell if someone is good looking based on pictures: the problem is that you need to see how the still features animate. AT&T recently posted an advertisement for Black History Month with the unfortunately genocidal-sounding slogan make black history! I'm taking forty days off technology for Lent. I'll pop on to post an analog blog or two but will be limiting myself to a half hour of screen time a day, just enough to get necessary emails, bills, and grading done. If you'd like to talk, we can resort to pen and paper and postage. 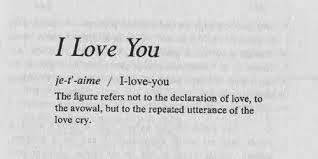 I've been reading A Lover's Discourse by Roland Barthes. In it he writes how letters need a reply: Perpetual monologues apropos of a loved being, which are neither corrected nor nourished by that being, lead to erroneous notions concerning mutual relations and make us strangers to each other when we meet again, so that we find things different from what, without realizing it, we imagined. Dear reader, let not silence stand between us, lest we be strangers to one another. And so, I send you this flimsy blog post, a late valentine of sorts. May love and friendship keep you warm through the dregs of winter and carry you on into a glorious summer of swimming and strawberries.